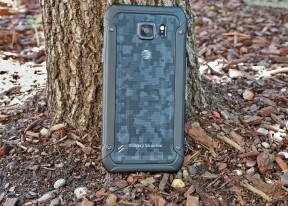 Samsung Galaxy S6 Active comes with Android 5.0.2 Lollipop and the latest TouchWiz UX. Samsung has been on a mission to simplify its software recently, but there are brand new features too. Most of the new stuff is now available to the Galaxy S5 as well via the recent update to Android Lollipop, but there are still features available only on the Galaxy S6 family. The lockscreen is quite busy. It shows two notifications, any more get collapsed and you only see their icons. You can tap the down arrow to see the full list. If an app gets too pushy, you can hide its notifications from the lockscreen. There is also a weather information for your location and pedometer stats. Both a dialer and camera shortcuts are available, but we prefer the other camera shortcut - double-tap the Home key from anywhere in the UI and the camera launches within a second. 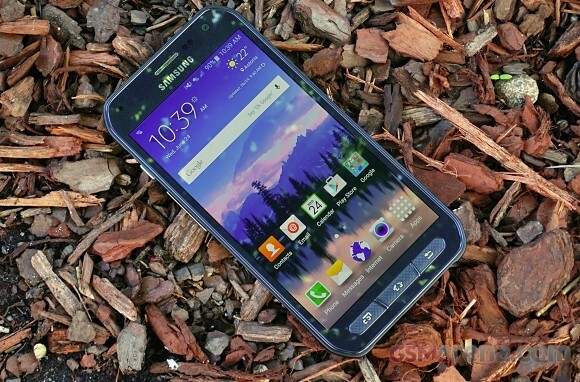 Samsung Galaxy S6 Active features an exclusive wallpaper of a landscape. The latter is similar to the one found in the device's predecessor. A nice feature allows you to hide the content of the lockscreen notifications or disable them altogether so people can't snoop on your received messages and emails. Smart Lock disables the secure locking options when a trusted device is connected (Bluetooth smartwatch or car stereo or an NFC sticker) or when the phone is in a trusted location. Unfortunately, that's determined by geo-positioning only, you can' add a trusted Wi-Fi network. We're finally past the lockscreen and we arrive to see much improved theming support, which the Galaxy S5 lacks altogether. We only got three preinstalled on the Galaxy S6 Active, but for the first time, you can download more in the Galaxy Apps store. Themes can change the wallpaper and icons, but also some Samsung apps (dialer, contacts, messages) and the notification area. Themes are not just graphical either, a theme can add new ringtones, notification tones, alarm sounds and more. The homescreen itself is quite normal. You get the optional Briefing pane on the left, which pulls info from a selection of news sources on topics you find interesting. There's an option to change the screen grid between 4x4, 4x5 and 5x5, the smallest one is the default. The wallpaper now has a subtle parallax effect that we didn't notice at first. Then we did and it just felt too similar to the iPhone wallpaper. Android 5.1.1 will allow users to disable the effect if they desire. The notification area hasn't changed much, but it has lost the view that shows all quick toggles - neither a second pull nor a two-finger pull works. You just get one scrollable row of quick toggles, but now some have text underneath, like the name of the Wi-Fi network you are connected to. The brightness slider is below that and then the S Finder and Quick connect buttons. One cool feature is that while adjusting the slider, the notification area fades away so you can see the app you were using before. None of these elements can be disabled, but you can rearrange the quick toggles by tapping the Edit button. This screen shows all quick toggles and you can tap them to enable/disable, but the old way felt more intuitive. Samsung Galaxy S6 Active comes with a page and a half of icons in its app drawer, but several folders conceal the actual number of pre-installed apps. There's a Social folder with Instagram, Facebook Messenger and WhatsApp and more interestingly the Microsoft folder. Sadly, AT&T has gone overboard with the bloatware on the device - there are no less than 18 carrier applications that you are not likely to need. Considering that the device has limited storage, we find such a move by the carrier a tad excessive. Thankfully, you can disable most of the preinstalled AT&T apps. Just be prepared to waste several minutes of your life doing so. Samsung has partnered with Microsoft so you get OneDrive (instead of Dropbox), OneNote and Skype out of the box. These apps cannot be uninstalled, but merely disabled. We'll cover the app package in more detail later. Multi Window is now part of the app switcher. TouchWiz uses the Lollipop-style 3D rolodex of apps, but next to the X button is a button that opens the app across half the screen. The other half is filled in with a similar rolodex with only apps that support Multi Window. Not all work with it, but the three social networking apps, the two browsers and several other key apps work just fine. Another way to launch Multi Window is to long press the App switcher key. If the current app supports Multi Window it will shrink to half the screen, the other half will be taken up by the icons of supported apps. If not, you just get the list of apps. The Setting menu features Quick settings - a selection of the most used options you can use. Below that is the full list, though we prefer using the search function as the extensive features that Samsung has provided can be hard to track down among menus and submenus. Pressing the shortcut key on the side of the device takes you to the Activity Zone. The latter contains shortcuts for weather, the barometer, the compass, S Health, flashlight, the stopwatch, and Samsung's Milk music player. You can customize the button functionality too. Both the long and the short press can be tweaked. The TouchWiz software on the new Samsung Galaxy S6 Active runs smooth and with no slowdowns. TouchWiz gets a lot of hate over perceived lag, but there is none on the Galaxy S6 Active and it features smooth Lollipop-like animated transitions, which makes the experience even better.